At Build a Dream Playhouses™, we strive to deliver safe, affordable, eco-friendly products that stimulate and encourage the endless imagination of ALL children. Our quality products offer the tangible framework for children to place their intangible dreams. 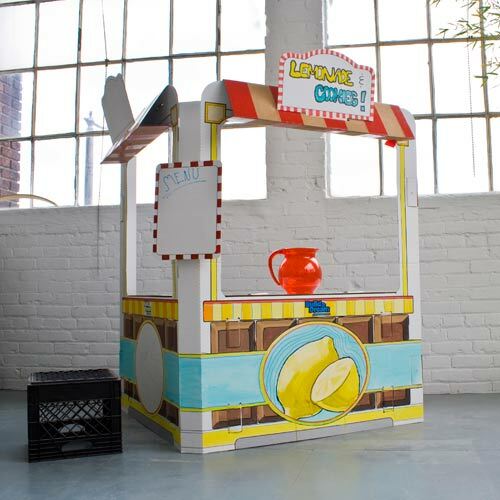 Build a Dream Playhouses™ was founded by a Cleveland father dedicated to the futures of the City of Cleveland, the State of Ohio, and the imaginations of children. To achieve that, and reflecting on his city’s hard times, he collaborated with the world famous Nottingham-Spirk Design Associates, a group of 3 to 9 year old children, and the Smurfit Stone Container Corporation, Build a Dream Playhouses™ is now proud to introduce to you what we believe to be the most innovative, fresh, and fun playhouses on the market. We hope you enjoy our products and we look forward to introducing many more in the near future. This year was our son's first year of school. Throughout the school year he was encouraged to get involved in our local community, and at the end of the year they completed their first "Community Action" project for school. Each of them were encouraged to pick a charity (from a provided list) and donate a few hours of their time. B chose Alex's Lemonade Stand. He participated in their National Lemonade Day's by holding his stand in front of our local YMCA. We spent the weeks prior planning and preparing for the big day. The kids got in the spirit by coloring, helping me assemble, and playing with the Snack Shack by Build A Dream Playhouses! Our kiddo's spent an entire rainy afternoon coloring their Snack Shack (FUN! perfect activity for a rainy day) and the following day we assembled it (assembly is quick and simple - see below video). They have enjoyed COUNTLESS HOURS of imaginative play in their unique creation.. The pride that came from actually creating it has made it one of their most cherished toys. I'm positive they'll enjoy many more hours of memory making FUN in their Build A Dream Playhouses Snack Shack. Inspire creativity and imagination in your little one's this Summer, with a customizable creation from Build A Dream Playhouses! Inspire Imagination & Creativity in your Little Ones! One Lucky Reader will receive a Build A Dream Playhouse of their choice! "Like" Build A Dream Playhouses on Facebook and public GFC follower. Thanks! 1. I entered the Rockboard Scooter giveaway. 2. I entered the Rockboard Scooter giveaway. 3. I entered the Rockboard Scooter giveaway. 4. I entered the Rockboard Scooter giveaway. 5. I entered the Rockboard Scooter giveaway. I like build a dream house on fb Jammie M, i am a google follower Jammie.